Greetings from St. Joseph’s Indian School! My name is Julie H and I am a Family Service Counselor at St. Joseph’s, working with girls in grades 6-12. I recently had celebrated my 12th anniversary as an employee here. Can you believe it? 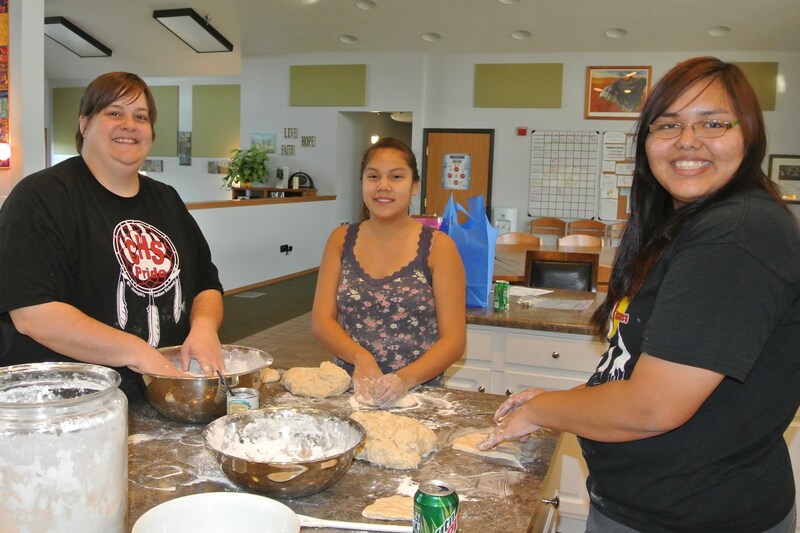 Julie helps Kezrai and Angela make fry bread for the meal following an Inipi ceremony, which is the rite of purification in Lakota tradition. My first two years at St. Joseph’s, I was a houseparent for the Lakota students in sixth, seventh and eighth grades. My next two years I was a Case Coordinator, and for the last eight years I have been a Family Service Counselor. My, how time flies! As I look out my window today and see a bit of snow in the air, I am in a contemplative mood. I have had the question posed to me, more often lately, what brought me to St. Joseph’s and why I choose to stay? The answer is really simple, actually. It’s the students. The opportunity to work with kids brought me here, and that is what keeps me here. I have said, since I came to St. Joseph’s, that working here is not a job – it is a calling. God reached into my heart and my life and brought me here to this wonderful place. There is really no other explanation. I will be honest… this job can bring a person to tears. Tears of JOY when a student succeeds, tears of sadness when a student leaves, hurts, or struggles. Working at St. Joseph’s is a calling of the heart. And the human heart is a fragile thing. Working with our students can put your feet on a cloud, but it can also bring you to your knees. Why? Because it is a job of the heart. We, the staff of St. Joseph’s, lead with our heart. We want what is best for the students and their families. We rejoice when our families rejoice, we weep when our families weep. We celebrate when a student gets an A on a test, our hearts break when a student is disappointed or let down. We only want what is best for our Native American students, but we all know life isn’t always fair and sometimes bad things happen to good people. When that happens, we put our hearts into it and support our families and students the best we can. I am feeling truly blessed today that my calling has been to work with the families and children at St. Joseph’s. The good days outnumber the bad, the tears of joy outnumber the tears of sadness and saying “I work at St. Joseph’s Indian School,” always leaves my heart feeling full and happy. This is a calling…but I could not fulfill my calling without the prayers and support of you, the benefactors of St. Joseph’s Indian School Without your support, we would not be able to offer the programs, stability, and safety we offer to our students. Without your support, we would not be able to offer the support we do for our families. So while my job is a calling, your support is a calling as well. And I thank God every day that you have been called to be part of the St. Joseph’s family. I send blessings and prayers your way as we move into the holiday season. May God bless you abundantly and fill your heart with joy for being called to St. Joseph’s. A truly lovely blog posting Julie … thank you! I couldn’t agree more. Great post Julie!